MIRAMAR, Fla.--(BUSINESS WIRE)--Hytera, a leading global provider of innovative Professional Mobile Radio (PMR) communications solutions announces a new range of features for its Digital Mobile Radio (DMR) portfolio. These innovative features will address the growing market demands and further enhance Hytera’s leading position in the provision of DMR products. The new features will be available across the portfolio including repeaters, mobile radios and portable radios. Hytera now is extending the feature of full duplex call into Repeater Mode Operation (RMO) and Direct Mode Operation (DMO); full-duplex coverage will be greatly enlarged beyond Trunking Mode Operation (TMO) without extra hardware investments. Over the Air Programming (OTAP) has been available for some time in Hytera’s trunking systems, and this provides great flexibility for operators; Hytera is now introducing this into their conventional repeater operation allowing radios to be reprogramed remotely. Optimized Push-to-talk allows users to talk instantly after PTT even before the call is established. The new features for repeater, mobile and portable radios will bring higher productivity, greater safety and better user experience. “Duplex operation, OTAP and Optimized Push-to-talk are just a few of a plethora of new features for Hytera radios. We have extensively researched the market requirements and are confident that will allow the users of Hytera radios to reap significant productivity and safety benefits,” said Cragg. 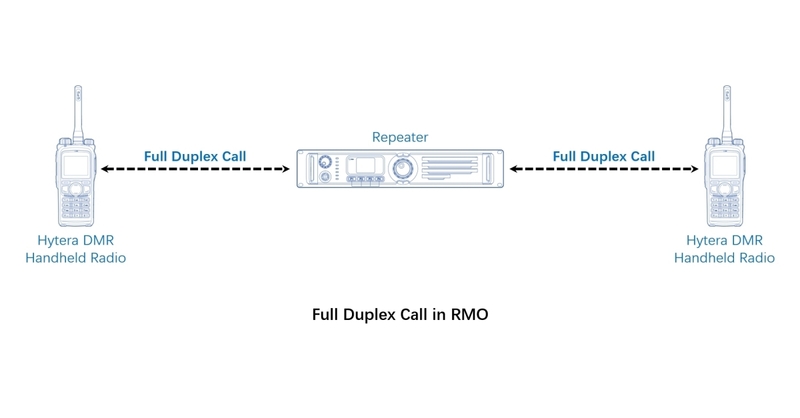 Full Duplex Call in RMO: Simultaneous voice transmission and reception in full duplex call now is available in Repeater Mode Operation (RMO) and Direct Mode Operation (DMO). It greatly enlarges full-duplex coverage beyond Trunking Mode Operation (TMO); long calls are made hands-free and much more efficiently between radios, and even between radios and phones. Advanced Back-to-back Connection: More powerful than traditional back-to-back connection, this new feature sends not only audio, but also signaling and data. With the Advanced Back-to-back Connection, a radio receives a bunch of cross patch calls from another system, recognizing the PTT ID and receive text messages from initiator. It also establishes remote RF link between sites; through serial port back-to-back connection to repeater, the mobile transmits signal, data and voice. Data relays through serial port interconnection between the mobile and repeater. With this new feature, Hytera control station can provide RF link for the repeater network when there is no solid backhaul connection. OTAP for Conventional Repeater System: Over the Air Programming modifies the parameters of remote terminals through the air interface signaling, including digital conventional channel parameters and part parameters of the terminal. It saves time and manpower to operate and maintain a radio system. Offline GPS Data Storage: The radio model with micro SD card inside can store offline GPS data now when you are not in the system coverage. Getting back to the office, it’s quite easy to export the offline data to the dispatch system to record the history track of a radio. Enhanced Quick GPS: Compressed GPS data can be packaged in a single frame to greatly increase the capacity up to 450 units/min, which is tripled in DMR Tier II system. This enhancement improves channel efficiency for data and reduce hardware cost. Trunking & Conventional Switch: By pressing a single button or twisting the channel knob, it enables radios to be switched between trunking and conventional mode without restarting. During this process, registration & deregistration in trunking system is done automatically, and over the air authentication is still available. Optimized Push-to-talk: It allows a radio to set up audio buffer and store what the user speaks before the call is established. Then it sends the stored audio together with the coming real-time audio after the call is established. Therefore, users can talk right after pressing PTT without waiting for the “go-ahead tone.” This feature also enhances the handover function without dropping communications in Tier III system during sites switch. Out-of-range Notification in RMO: A radio is always notified when it has left the repeater coverage. The users can realize if they are in the talk range all the time by paying attention to the alert tone. Hytera Communications Corporation Limited is a leading global provider of innovative professional land mobile radio (LMR) communications solutions to governmental organizations, public security institutions, and customers from other industries including transportation, oil and gas, and many others around the world. Founded in Shenzhen, China in 1993 and listed on the Shenzhen Stock Exchange (002583.SZ), Hytera has ten research and development centers around the world and has partnered with companies in the U.S. since 2000. Hytera established its first U.S. subsidiary, Hytera America, Inc., in 2004. It established Hytera Communications America (West), Inc., in 2016. Hytera owns PowerTrunk, Inc., and Sepura LLC, and has research and servicing facilities in Schaumburg, Ill. More information is at www.hytera.com.